Netcetera Review 2019: Is Netcetera a Good Hosting? U.K. hosting provider Netcetera was founded in 1996. They provide businesses in more than 75 countries with colocation services, dedicated servers, and managed hosting solutions. 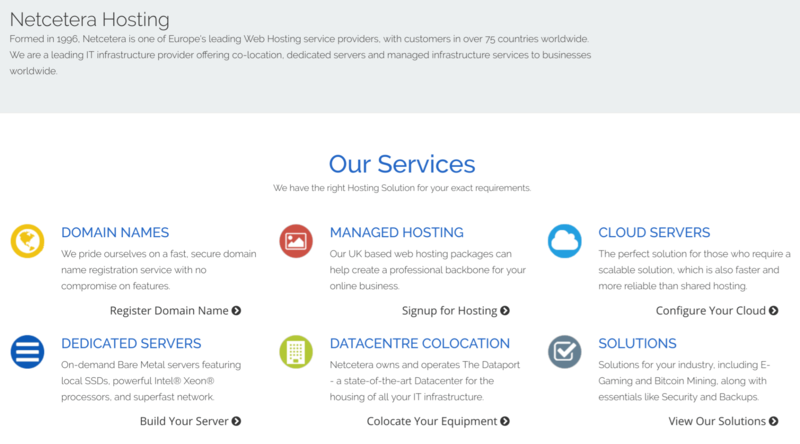 Netcetera is one of the leading web hosting providers in the U.K. The company has been in business since 1996 and can boast a client base in more than 75 countries around the world. They pride themselves on offering premium hosting solutions including dedicated servers, colocation and managed infrastructure services to businesses worldwide. Netcetera fully owns and manages the state-of-the-art Tier 3+ Dataport data center located on the Isle of Man. This data center is monitored 24/7 and is connected to a fast multi-homed internet backbone network. Their Dell servers use SSDs so that the websites they host will load up to 20 times faster than those hosted on traditional HDD servers. Also, this provider offers on-demand bare metal dedicated servers powered by local SSDs and robust Intel Xeon processors. Netcetera offers daily data backups to ensure that your data is always safe in the event of a disaster. They provide Comodo and GeoTrust SSL certificates as an extra package, for users who need more advanced verification. Finally, they offer a time-tested, award-winning 100% uptime guarantee. Netcetera has found a way to deliver pocket-friendly hosting plans that are packed with high-quality features and have very few limitations. They have adopted a straightforward pricing model with a one-month billing cycle and no extra or hidden charges. You get a free domain with any hosting plan, plus free site builders and DNS hosting for every one of the domains you host with them. Although the monthly billing cycle reduces your risk, you can take further comfort from the fact that they also offer a 30-day money-back guarantee. You can reach Netcetera’s 24/7 support team via email, live chat, telephone or ticketing system. The support team’s response time is pretty short, and they are professional, polite, and competent enough to deal with their clients’ issues. There is also a pretty comprehensive knowledge base packed with informative articles and video tutorials. Netcetera is a good all-round web hosting company that has invested heavily in hosting infrastructure and expertise to provide quality hosting solutions that few other vendors can match. This vendor has what it takes to host businesses of all sizes in the U.K. and beyond. Wondering how Netcetera stacks up against other Web Hosting companies? Enter any other Web Hosting company and we will give you a side-by-side comparison.